But gun-control organizations still remain popular. 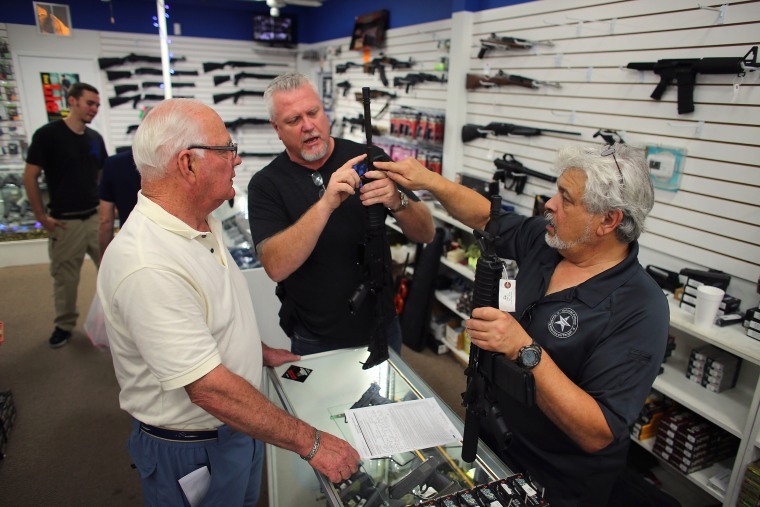 WASHINGTON — Nearly six in 10 Americans say that gun ownership increases safety, even as a plurality of respondents support gun-control organizations, according to the latest NBC News/Wall Street Journal poll. These numbers come in advance of Saturday's march in Washington — and across the country — calling for an end to gun violence and mass shootings after the Feb. 14 shootings in Parkland, Florida. In the poll, 58 percent agree with the statement that gun ownership does more to increase safety by allowing law-abiding citizens to protect themselves. By contrast, 38 percent say that gun ownership reduces safety by giving too many people access to firearms, increasing the chances for accidental misuse. These findings represent a reversal from 1999, when a majority — 52 percent — said gun ownership reduces safety. And they come at a time when 47 percent of American adults say they have a firearm in the household, up from 44 percent in 1999. The numbers also highlight a stark divide by party, with 89 percent of Republicans and 65 percent of independents saying gun ownership increases safety, versus just 28 percent of Democrats who agree. Still, gun-control organizations are one of the most popular organizations or movements that the NBC/WSJ poll measured. Forty-eight percent of Americans say they support gun-control organizations, including 34 percent who strongly support them. That's compared with 32 percent who oppose gun-control organizations. As a plurality of Americans say they back gun-control organizations, the latest NBC/WSJ poll finds the National Rifle Association with its worst net positive-negative score since the 1990s. Thirty-seven percent of respondents view the NRA positively, while 40 percent see it in a negative light. That’s a noticeable shift from April 2017, when it was 45 percent positive, 33 percent negative. The biggest drops for the NRA come from white married women (50 percent positive in April 2017, 35 percent now), urban residents (43 percent positive in April, 28 percent now), white women (47 percent positive in April, 33 percent now) and moderate/soft Republicans (72 percent positive in April, 60 percent now). The live-caller NBC/WSJ poll was conducted March 10-14 of 1,100 adults – including nearly half by cell phone – and it has an overall margin of error of plus-minus 3.0 percentage points.